This entry was posted in Active Directory, Operating Systems, Software, System Administrator, Technology and tagged Add Single User, Admin, Computer, Domain, GPO, Group Policy, Local, Local Administrator, Server 2008, User by Nerd Drivel. Bookmark the permalink. What if two computers in the enterprise have the same name? I tried to add user which logs on to the computer by typing %DomainName%\%Username% – why it didn’t work? What if another user loggs on? I suppose that it will be also added to the %ComputerName%.ADMIN group – can it be done in the way that only the first user (which joined computer to the domain) can be added to this ‘%ComputerName%.ADMIN’ group? You should not have two computers on an enterprise network with the same name, this is bad practice and can cause conflicts. Each computer should have a unique identifier/name. You have to note that everything is done in Policy. Nothing is changed on the computer side. There are several steps involved in creating this policy for each step you need to create a new Local Group. 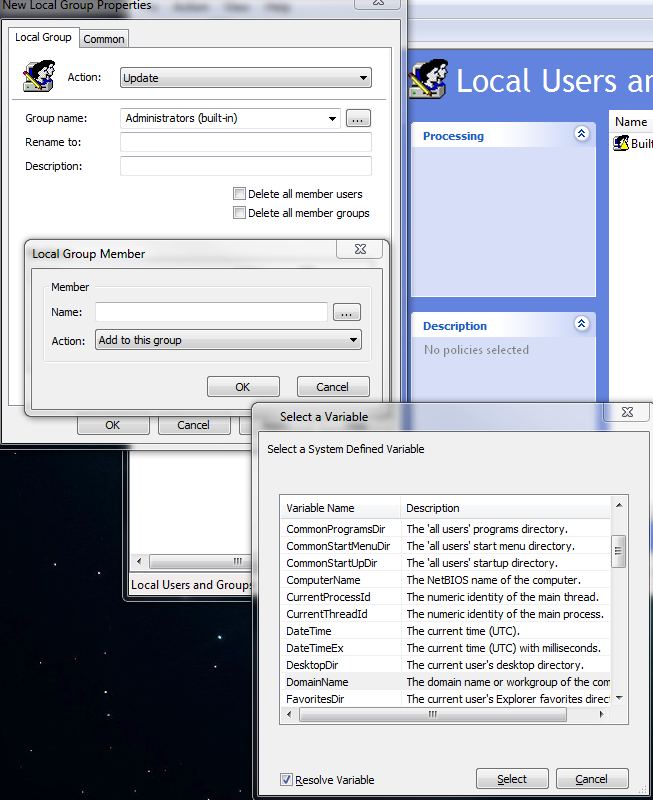 Each step will involve creating a new Local Group by right clicking, selecting – New – User Group. Each time you will be Updating the Administrators (built-in) group, except for step 4. 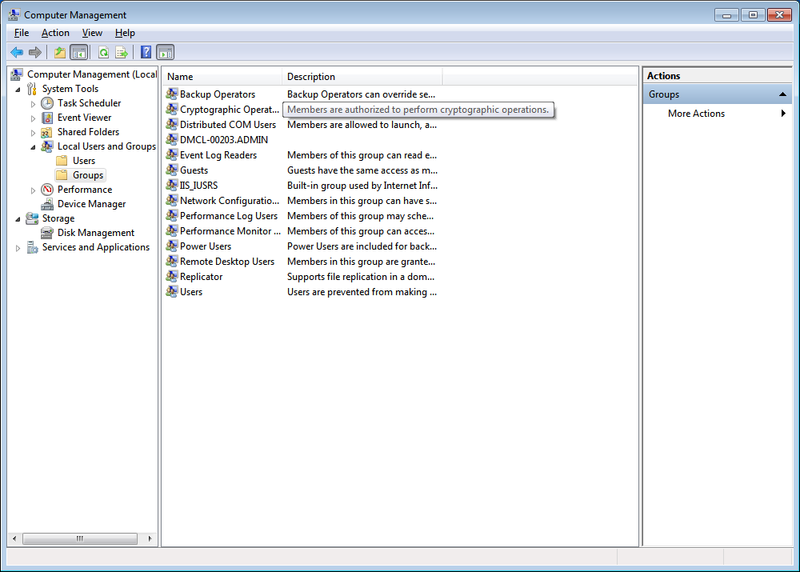 All these below steps are performed in you Group Policy under, Computer Configuration – Preferences – Control Panel Settings – Local Users and Groups. 1. You need to add any local accounts to the Administrators (built-in) group. 2. You need to add any Domain Admin accounts to the Administrators (built-in) group. Add yet another new Local Group call it . Here you add a domain user, set action to Update, Group name is Administrators (built-in), and Members will be %DomainName%\zawisza , zawisza being a user name of a Domain Admin. 3. 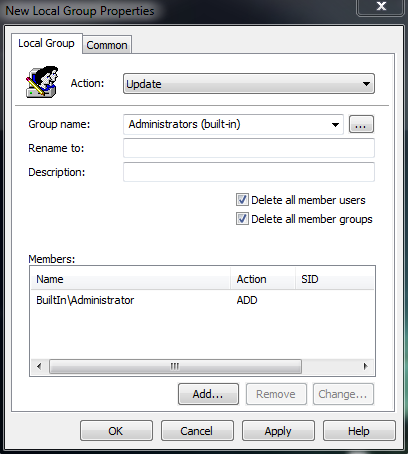 Then you rename the Administrators (built-in) group. 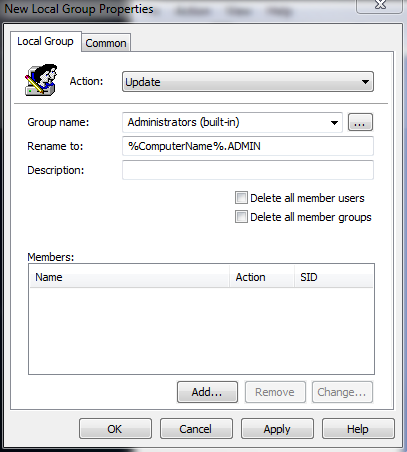 Add another new Local Group, action is Update, group name Administrators (built-in), Rename to %ComputerName%.ADMIN, there are no members in this group. 4. Here is where you create a computer specific ADMIN group. This is where you grant an individual user Admin rights on a specific computer. In this example let's say you have a computer on the domain called "MojKomputer". Create a new Local Group, Action is set to Update, group name MojKomputer.ADMIN, Members %DomainName%\zawisza. If you only want to add one user as an administrator to all the computers on the Domain, do only step 2 of the above, ignore all the other steps. Hello, I’m trying to get it working in my domain, without success 😦 Domain Windows 2008, client Windows 7 Pro SP1 “Remote Desktop Users (built-in)” ; “delete all members users” and “delete all members groups” selected; Members action ADD: MyDomainName\GlobalRDPUsers In the window under Members section I see: Name Action SID MyDomainName\GlobalRDPUsers ADD S-1-5-21-20….. and this policy is not removing any other accounts in “Remote Desktop Users” local group nor adding that MyDomainName\GlobalRDPUsers In GPO Result I see that this policy had been applied with success but apparantly result is wrong. ‘If you only want to add one user as an administrator to all the computers on the Domain, do only step 2 of the above, ignore all the other steps.” – I don’t know if I got it right, but I don’t want to have one user who would be administrator on every computer on the Domain. I wan to have each user to be administrator only on one, specified computer and nowhere else. So for example You bind the user only to the computer he joined to the domain and then You make him an administrator there and nowhere else. How to do that? You should always assign the built in “Administrator” account and the “Domain Administrators” group to the local Admin computer groups. Then Start with Step 12 in the post and continue on. This is where you assign individual users as admins to the domain. Note that these policies override the admin settings on all computers and replace them on the domain. Unless this policy applies to a specific OU. Will the local admin rights stay operational when the user logs on later with cached credentials not being connected on the network? Absolutely, the OS will cache all the domain credentials and group policy locally. I already know how to do this part, however I need some assistance, I have created a GPO that specifies/mandates a BGinfo wallpaper and a custom ssText3d Screensaver, however local users are not allowed to be local admins of their machines for security reasons. 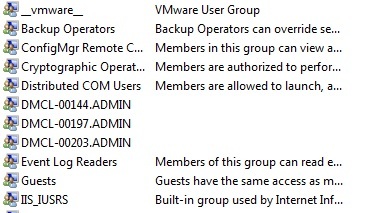 i know how to add Domain users or check the box for add current user to get them into the built in Administrators, and on my test machines this allows the GPO to apply correctly, what i can’t get (probably something easy) is how do i make it remove that group or user AFTER the GPO applies? Do i need to another GPO configured to remove them and change the order in which the GPO’s apply? 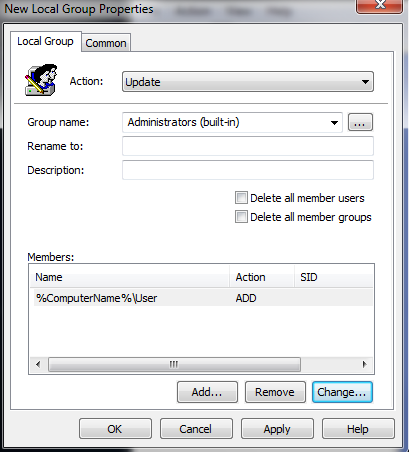 or just do another “add” within the same GPO to Remove current user/group? if so what order should they be in? After this has applied to the computer, you would need to delete the existing policy, and create a new policy to remove the users or groups permissions. Mind you I don’t understand why you can’t use a domain admin account to push the wallpaper to all the computers. I’m new to GPO though with years in the IT as to Linux/Network. Honestly by following this very first step I don’t see the way to locate an OU within gpedit.msc. A program that allows me to see the policies at the domain level and also the structure is te Group Policy Managemtn Console (gpmc.msc). Thanks for catching that, and you’re right gpedit is just a policy editor. The management console is gpmc.msc. I’ll fix it, thanks for that again. that I really would want to…HaHa). You certainly put a brand new spin on a subject which has been discussed for decades. So to make someone a local admin on just one machine, I just have to add this computer’s name to the user’s Description in AD and ask user to reboot, and removing the computer’s name removes the local admin rights. :: an error ‘label not found’ should mean script terminates, but anyway make sure it terminates. Thanks for that. That is pretty cool. I have since revised this and Updated it with a better way to accomplish it via GPO. The post is about 1/3 of the length of this. It’s more efficient and easier to understand. Sheer genius Loyd!! Much simpler approach to add a single user to the local admins group without clearing out the current users in the group than I have seen in any other post online. This worked like a charm for me on the first try. I’m sorry to break this to you but computers on a domain should always have a unique identifier. Computers on any one network for that matter. I’m really surprised you are not getting DNS and DHCP conflicts. I suggest you rename one of the computers and try again. We need to figure out the solutions to restrict access to local admin groups based on the Group member ships. similar way we have User2 and he needs local admin access on other Server say Server2. and we make user2 member of same Server.admin group he should get local admin access on Server2. This we are figuring out to achieve with Variables %Computername%. How to achieve the above requirement with Variables %Comptername% or any other methods. Don’t use Groups, it’s inefficient and there would be extra steps involved in this. Just use a single policy and inside said policy under User – Preferences – Control Panel Settings – Local Users and Groups, add Administrators (built in) and do item level targeting. If you must use groups then you have to use Security Filtering, remove Authenticated Users and add your group. Then you either use WMI Filtering or Item Level Targeting inside the policy. User1 will be a Local Administrator of Computer 1 but not Computer 2 because User 2 is the only Local Administrator of that computer. If I’m going to add this 100 Users in each of those 100 Computers using ITL to have a cleaner look of Local Users and Groups of each computer. Basically, I’m only going to have 1 GPO but contains 100 Users and 100 Computers. How is gonna affect the logon or startup of each computers that is affected by this GPO? I would suggest following the link at the top of the page, this is the old method. While this works it will flood your domain with the policy. The newer method or revision does not and does not impact log in performance.